NEWSDESK: Former All Black coach Graham Henry has revealed he became physically sick when he realised the IRB had appointed a dickhead to officiate the All Blacks 2007 world cup quarter final match against France. “Watching the tape, I counted 40 missed penalties, and that pass was a mile forward for the try. Dickhead. Even Raewyn thought so,” said Henry. 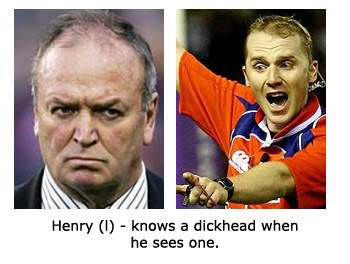 An IRB official who did not wish to be named, ruled out any behind the scenes dickhead-conspiracy. “Rugby prides itself as a sport in which everyone can participate, including dickheads. Wayne is living proof being a dickhead is no barrier to becoming an international referee.” Current All Black coach Steve Hansen refused to be drawn on Barnes, saying he’d prefer to concentrate on the dickheads his team were likely to face in the rugby championship. Henry’s book (“What A Flamin’ Dickhead” – AKLGrammar Press, $35.99) presents more evidence on the Barnes-dickhead theory, including Barnes’ high-waisted shorts and running style.